Flags and Banners are Unique Promotional Fixtures Ideal for Outdoor Set Up! 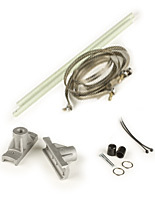 This Hardware Can Hold Two Signs Side-by-Side and is a Great Alternative to Flagpoles! View the Entire Online Catalog for Affordable Yet Durable Flags and Banners! 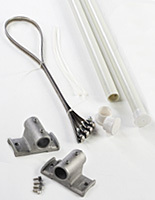 Banner pole hardware comes with bandings for lampposts up to 3' in circumference. Aluminum mounts and fiberglass poles are weather resistant. Prominently exhibits (2) 24"wide flags from a lamppost of any height. Flags and banners used with hardware can be an affordable and dependable way to mount 24"w signs. Each of the promotional accessories that come with the kit is designed to weather outdoor use throughout years of use. The flags and banners combined with hardware that exhibits vertically orientated signage makes hanging pennants along an avenue or sidewalk easy. Vinyl or fabric canvases are suited for use with this mounting equipment! 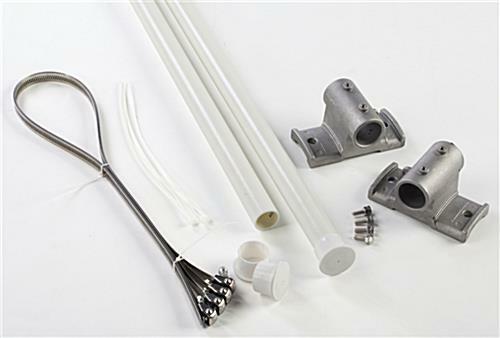 Flags and banners are enhanced with the two cast aluminum mounts. In addition, the poles have a fiberglass construction to withstand strong winds without damage. 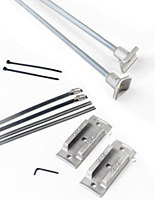 Setscrews secure the poles in the aluminum mounts, ensuring the poles stay centered within the brackets. 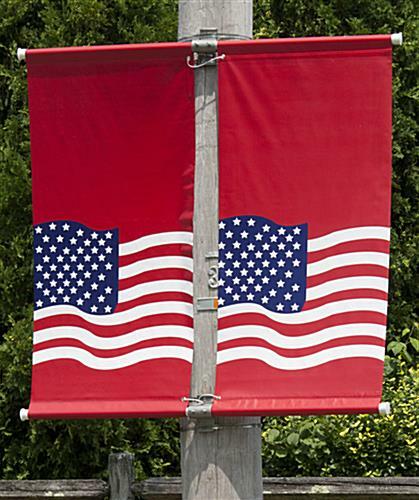 Flags and banners hardware with fiberglass poles is far superior to brackets that come incorporate plastic poles, as fiberglass is less prone to breaking. 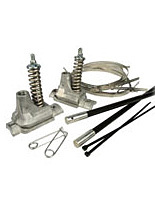 Screw gear bandings measuring 39" long are enclosed with the purchase of these street flag accessories, which makes these brackets compatible with lampposts that have a tapered or uniform shapes. This street flag mounting equipment does not have an on-post adjusting mechanism. The exclusion of this feature is specifically to keep the prices of the street flags and banners hardware as low as possible. 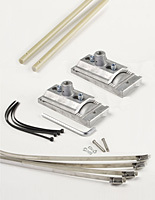 These brackets are, however, every bit as durable as more expensive models. Zip ties also come with these street pole brackets. The zip ties fit through grommets in your signs and holes molded into the cast aluminum brackets to ensure they do not slide off in windy conditions. 3.5" x 5.1" x 2.8"